Be the first to share your favorite memory, photo or story of Sandie. This memorial page is dedicated for family, friends and future generations to celebrate the life of their loved one. Sandie Middleton, 81, passed away November 26, 2018 in Bowling Green. Sandie was born in Marion, Ohio, to Woodrow and Betty Retterer. She married Tom Middleton in 1957, and they lived and raised a family in Bowling Green. In recent years, she and Tom spent much of the winter season on the Florida panhandle. An avid golfer and sports fan, Sandie won the Bowling Green Country Club Women’s A Flight Championship in 1994, and spent time on the Club’s Board of Directors. She created and organized the first several Football Busts, an annual banquet honoring the BGSU football team. That work earned her the 1983 Doyt Perry Award, given to distinguished contributors to BG football. 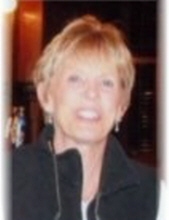 She and her friend Cena Stolz owned and operated a real estate brokerage, Broker Realty, for a time. She enjoyed playing bridge, both socially and competitively, with Cena and her friend Lorene Hall, among others. Sandie loved life. She loved golf, parties, games, her family, and her extensive array of friends. She learned to drive a motorcycle, and to pilot an airplane. She loved to laugh. She was always up for an adventure, and spent a good deal of time traveling throughout the United States with her husband and other family members. And she loved summer. A celebration of her life will be scheduled for early summer, 2019. Arrangements have been entrusted to Dunn Funeral Home in Bowling Green. Sandie is greatly missed by her husband Tom, her son Staten and his partner Jasmine Gramling, her daughter Gayle and son-in-law Jeffrey Silverstein, and her grandchildren Mitchell and Max Silverstein. She leaves her sisters, Peg Herron, Toni Pfister, Sharon Appleman, and Shirley Jones, her brothers Rick and Ron Retterer, and her great friend Marsha Wolf, with whom she spent many hours in recent years. She is survived by many nieces and nephews, as well as many good friends. She was predeceased by her brothers Gary and Terry Retterer. Friends and family who wish to honor Sandie’s memory are asked to do what she would have done this holiday season, and reach out to those who are less fortunate. The beneficiary of your generosity is up to you ~ Sandie would have happily helped them all, if she could have. To send flowers or a remembrance gift to the family of Sandie Middleton, please visit our Tribute Store. "Email Address" would like to share the life celebration of Sandie Middleton. Click on the "link" to go to share a favorite memory or leave a condolence message for the family.